It’s announced that Dr. Uromi Goodale, a postdoctoral researcher with XTBG Lab of Plant Physiological Ecology, has received the second-class General Financial Grant from the China Postdoctoral Science Foundation. She is one of the 2239 grant winners of the Foundation in China. Uromi Goodale received her B.Sc. at the University of Colombo, Sri Lanka in Botany, completing a thesis on the plant diversity and physiognomy of a lowland rainforest in Sri Lanka. 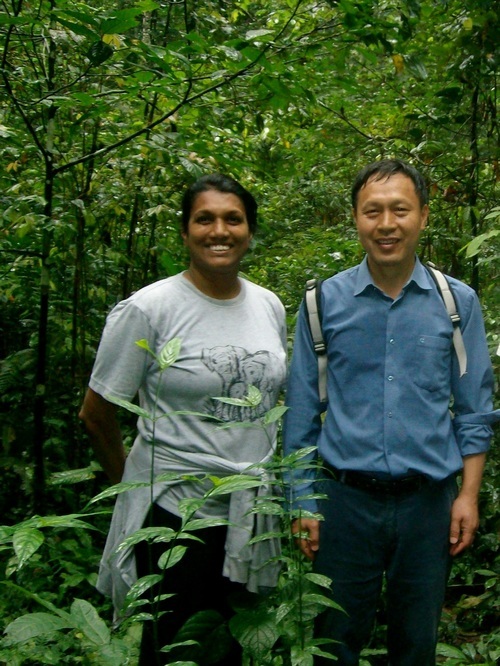 She obtained a Masters in Forest Science at the Yale School of Forestry and Environmental Studies, concentrating on allometric relationships of tropical pioneer species. She continued Yale to complete her Ph.D., focusing on the ecophysiological adaptations of the pioneer species along the forest gap-understory continuum, and their dynamic responses to changes in environmental conditions. Then she conducted her postdoctoral studies at Institutional Research and Academic Career Development Program (IRACDA), University of California, San Diego. In 2012, she came to XTBG as a postdoctoral fellow. In XTBG, she will use tools from plant ecology, physiology, anatomy and biochemistry to investigate the effects of variations in sunlight and precipitation on pioneer tree species in Xishuangbanna.